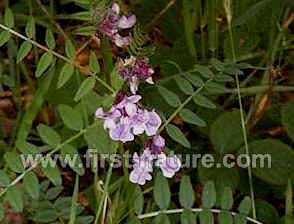 Also known as Upright Vetch, this wildflower is fairly widespread throughout the UK except for the far north. In Ireland it is only found in some western parts. There are no tendrils at the ends of the leaves of this self-supporting vetch, but rather the leaf stems end in short points. Wood Bitter-vetch is an early summer flower, blooming in May and June. There are many other kinds of vetches that you can find beside rivers and lakes and in hedgerows. The plant on this page was photographed in West Wales in June.